What If College Students Have Normal Views on Free Speech? What If College Students Have the Same Views on Free Speech As Everyone Else? 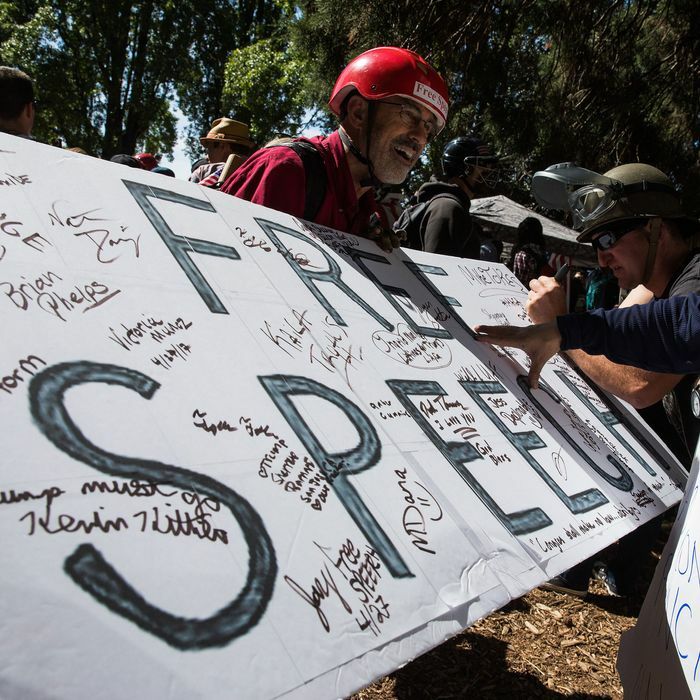 College students, you may have heard, are increasingly opposed to free speech. Especially liberal ones — they just can’t handle views they disagree with, especially conservative ones. Except: It might be more complicated than that. That’s the takeaway of a new survey of Yale University students — who made national headlines for an uproar over a Halloween-costume email back in 2015 — summed up by James Freeman in The Wall Street Journal. The slide deck notes on page 9, for example, that “[e]ight in ten [students surveyed] believe that freedom of speech should either be less limited on college campuses or there should be no difference compared to society at large.” On page 14, the authors write that “When given a list of choices, just one in ten believes colleges should regulate free speech more.” And on page 29, the authors note that “Greater than six in ten say political correctness on college campuses is either a ‘big problem’ (19%) or ‘somewhat of a problem’ (44%)” — though, to be fair, this can be interpreted both as evidence that college students respect free speech and of evidence that they think that PC culture is a problem on their campuses (though they don’t appear to be too exercised about it). Now, surveys are complicated and susceptible to rather wild swings based on question wording, so it would be wrong to cherry-pick any limited set of findings and then make sweeping generalizations about college students these days. Plus, there were some items on the survey where students weren’t quite so free-speech-friendly. And it goes without saying that what happens at Yale might not be applicable to the rest of the college population. [T]his number is well within the standard range of responses when not just college students but Americans have been asked if some forms of speech should be banned by the government. Despite what we’d like to tell ourselves about Americans’ fierce love of free speech, a lot of us have basically always supported “banning” its offensive varieties. What has changed, over time, is which categories of speech make people the most ban-happy — in the past it’s been pro-Communist propaganda, and more recently it’s been racial slurs. But at no point has it been unusual for something in the ballpark of “nearly half” of Americans to be in favor of government bans on some form of speech, so the fact that this same percentage of students are “supportive of restrictions on certain forms of free speech on campus” tells us exactly nothing. But, hey, without all that pesky context it sure does sound damning. Part of what’s going on here could come down to preference intensity and opportunity. By which I mean that college students who are in favor of expanding restrictions on free speech might feel relatively more strongly about it than do their pro-free-speech peers, and they have highly visible opportunities to express those views by attempting to no-platform speakers they don’t like, or responding assertively to instances of perceived administrator insensitivity. Whenever they do so, of course — or whenever they engage in any other act that can be portrayed as yet another instance of out-of-control college activists — it gets blown up to the status of a national news story. Twenty years ago, no one would have heard of a small group of Oberlin students protesting about the “cultural appropriation” of Banh Mi going on at a dining hall there, or about any of the dozen other similar blowups that seem to occur on a monthly basis. Furthermore, it’s very hard for stories that buck the trend — stories about how most college students aren’t sent into conniptions by appropriated Banh Mi — to get much traction because of the whole dog-bites-man thing: No one wants to write about college students who are acting like everyday American adults with fairly standard views on free speech. So while the phrase “silent majority” has some unfortunate political baggage affixed to it, it might accurately capture what’s going on here. There may not have been much real, substantive movement in the anti-free-speech direction on campus — a lot of kids don’t see the need to ban or no-platform offensive speakers, but they aren’t in the streets about it, and may simply not want to bother stating their own views during those instances in which things get out of hand. Because they’re quiet, they don’t get much coverage, skewing everyone’s view of college students as a group.